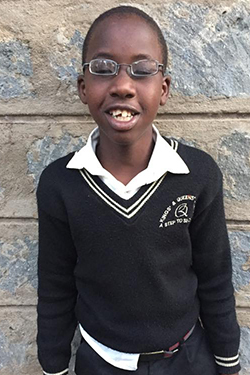 As Joshua's sponsor, you will support his education by helping with school fees and other costs that are required for children to attend school in Kenya. As we have already covered Joshua's school fees for the first two terms of 2017, Joshua needs your support for the third and final term of 2017 as well as for next year. But you can, of course, continue to sponsor Joshua for as long as you like! A goal of our student sponsorship program is to create a lasting and positive relationship between you and Joshua as he continues his education. We will regularly send you recent photos and updates on his progress in school, and Joshua will send you a letter at the end of each term. We also encourage you to send letters/emails and photos to Joshua as often as you would like! Our organization has already covered Joshua's school fees for the first two terms of 2017. We are still looking for a sponsor for the third and final term of the school year, and you can do so via the link below. For the next school year in 2018, we expect his school fees to go up only slightly (typically around $20 each year), but we will know for certain and post updated sponsorship costs in December. If you are interested in sponsoring Joshua for next year please email us at longonoteducationinitiative@gmail.com, and we will let you know of the exact cost of sponsorship for 2018 when available.